The wonderful thing about being a human is that we have the abilities to think and reason. We are a unique life form indeed in that sense, more than just the intention to survive and reproduce like the rest of the living things on this blue planet we thrive for knowledge too. If it wasn't the case we won’t be where we are now, all these discoveries and inventions, advancement in science and technology gave us a totally new outlook towards ourselves and as well as the universe we live in. Now we are moving forward in a fare pace in every aspects of life and so the need for revolutionizing the way of thinking is very much important as any other issue. The time has come for us to worry only about the present and future, we shouldn't waste time discussing the past and the hardships it brought. This age is perhaps the most crucial phase of the evolution of our thinking, free thinking is getting more popularized among the youth and I strongly believe that only it can prevent us from destroying ourselves. 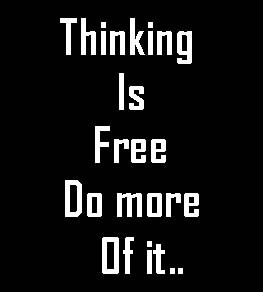 One may qualify as a free thinker if he is able to think beyond or built more on what he have already observed, learned and reasoned, and is thus setting new parameters for others to think. Physical and emotional attachments are necessary for a happy life but one shouldn't let it cloud his entire thinking process. Leaving a neutral spacing in the head would help one to properly utilize his capacity of free thinking, unless it is neutral it won’t be easy to create a calm mind set to analyze situations separately and find solutions for one’s own problems. Putting too much assumptions and over guess work on a matter will always complicate things making them almost unsolvable, Keeping things simple and clear always help to find an effective solution. So I am now concluding my brief note by adding a bit more to a famous wording “Think clear and simple before you leap”. 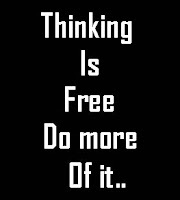 Since we have a wonderful brain it won’t hurt in any means to use it wisely, be a free thinker and live a happy life. 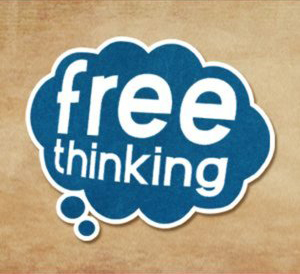 hmmm...you got me thinking;) the fact is that we seldom think free, out thinking is always influenced by factors that are not always rational. If humans have the faculty of thinking that keeps us apart from animals then these very emotions make us 'humane'. You know the value of dollar to rupees! all you need to do is click a few ads which takes only half an hour per day! This post making me think about the thinking power of human brain... pretty thought provoking. You are right in that we are thinking beings and that we should actively ... think. You say, "The time has come for us to worry only about the present and future, we shouldn't waste time discussing the past and the hardships it brought." >>>> Isn't that akin to censoring one's own thought process. Just because it is past does not mean it has nothing to teach us. In fact, history is a pretty good indicator of things to come. One's thinking should not be limited to thinking about the present and the future. That is not thinking. That is fooling oneself. However, I completely agree with you that "... only it [thinking] can prevent us from destroying ourselves."